Low prices and lots of ravings on blogs managed to lure me into buying from Elf quite a few times. I own few bits from each of their ranges: basic, mineral and studio. Overall studio products are best quality and althou their prices went up a notch, £3.75 is still a bargain for a good blusher. Plus once you order from the website, you will be receiving lots of discount coupons on your email so you can save even more pennies. There are few things I like and reach for from time to time but they don't stand out for me. You won’t see those in this post ;) What you will see are products I love and use almost on a daily basis and products I truly dislike and not been using at all. 1) Studio Cream Eyeshadow in Dawn – lovely taupe with sheen. Colour is definitely buildable. It’s not very creamy but thanks to that it doesn’t crease and stays on all day! I wear it on its own or as a base under a powder eyeshadow. It works both ways. 2) Studio Eyebrow Kit in Medium – little bit dark for me (that’s my own fault for not picking up light one!) but works fine applied light handed. I mix powder and wax together with an angled brush and fill out my eyebrows. It keeps them looking groomed but still natural. 3) Mineral Lipstick in Runway Pink – formula is kinda between matte and cream. Stays on the lips for a long time without fading and doesn’t dry them out. I tend to blend it in with my finger, reapply it and blend it again. That way it creates sort of a stain on the lips and stays on even longer. I have two more shades from this range and they’re just as good! 4) Studio Blush in Tickled Pink – creamy, long lasting formula here. It’s not super pigmented but buildable shade. Quite light colour so suitable for light complexion girls. I actually like that it’s not very pigmented because it’s easier to blend by applying 2-3 layers. I always end up with massive blob of colour with strongly pigmented blushes! 5) Studio High Definition Powder – translucent, finely milled finishing powder. I’ve never owned such soft and delicate powder before! It doesn’t take away from dewiness of foundation and keeps the shine at bay. Looks white and scary but doesn’t leave any colour on the skin. 1) Six pc. Eyeshadow in Smoky – shadows are dry and very hard to blend. Pigmentation isn’t bad but glitter goes absolutely everywhere but it doesn’t stick to the lid. I’ve tried using it a few times and gave up. Not worth the effort for £3.50. In fact it’s not worth the £3.50. 2) Brightening eyeliner – way too hard for me. I need soft and blend able liners and this isn’t it. 3) Super Glossy Lip Shine in Malt Shake – the reason I’m disappointed in this is because the colour is NOWHERE near the one showed on the website. Picture shows pretty pink and I got brown and I don’t do brown lips. Shame because lip gloss itself is really nice – thick, pigmented and not too sticky. 4) Clarifying Pressed Powder – very drying and looks powdery on the face. Not much pigment in there either. 5) All Over Color Stick in Lilac Petal – glittery and difficult to blend. Looks very unnatural plus it disappears from the face after 5 seconds. 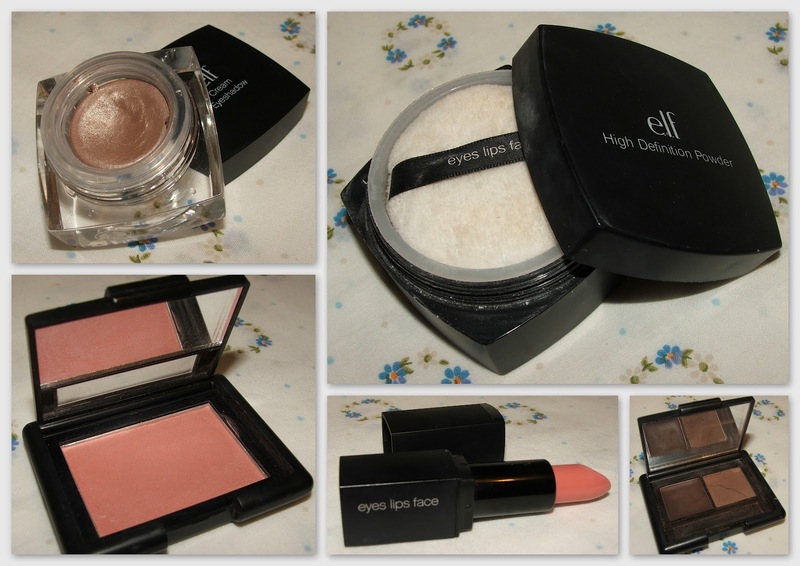 Considering how much stuff I bought from ELF five disappointments is not much at all! And for such a low price I really don’t mind trying stuff out. I also think their translucent powder is really nice, along with their makeup brushes too! You should defo try the powder. It really is great!